SALV. The constant activity which you Venetians display in your famous arsenal suggests to the studious mind a large field for investigation, especially that part of the work which involves mechanics; for in this department all types of instruments and machines are constantly being constructed by many artisans, among whom there must be some who, partly by inherited experience and partly by their own observations, have become highly expert and clever in explanation. SAGR. You are quite right. Indeed, I myself, being curious by nature, frequently visit this place for the mere pleasure of observing the work of those who, on account of their superiority over other artisans, we call "first rank men." Conference with them has often helped me in the investigation of certain effects including not only those which are striking, but also those which are recondite and almost incredible. At times also I have been put to confusion and driven to despair of ever explaining something for which I could not account, but which my senses told me to be true. And notwithstanding the fact that what the old man told us a little while ago is proverbial and commonly accepted, yet it seemed to me altogether false, like many another saying which is current among the ignorant; for I think they introduce these expressions in order to give the appearance of knowing something about matters which they do not understand. SALV. You refer, perhaps, to that last remark of his when we asked the reason why they employed stocks, scaffolding and bracing of larger dimensions for launching a big vessel than they do for a small one; and he answered that they did this in order to avoid the danger of the ship parting under its own heavy weight [vasta mole], a danger to which small boats are not subject? SAGR. Yes, that is what I mean; and I refer especially to his last assertion which I have always regarded as a false, though current, opinion; namely, that in speaking of these and other similar machines one cannot argue from the small to the large, because many devices which succeed on a small scale do not work on a large scale. Now, since mechanics has its foundation in geometry, where mere size cuts no figure, I do not see that the properties of circles, triangles, cylinders, cones and other solid figures will change with their size. If, therefore, a large machine be constructed in such a way that its parts bear to one another the same ratio as in a smaller one, and if the smaller is sufficiently strong for the purpose for which it was designed, I do not see why the larger also should not be able to withstand any severe and destructive tests to which it may be subjected. did not exist and matter were absolutely perfect, unalterable and free from all accidental variations, still the mere fact that it is matter makes the larger machine, built of the same material and in the same proportion as the smaller, correspond with exactness to the smaller in every respect except that it will not be so strong or so resistant against violent treatment; the larger the machine, the greater its weakness. Since I assume matter to be unchangeable and always the same, it is clear that we are no less able to treat this constant and invariable property in a rigid manner than if it belonged to simple and pure mathematics. Therefore, Sagredo, you would do well to change the opinion which you, and perhaps also many other students of mechanics, have entertained concerning the ability of machines and structures to resist external disturbances, thinking that when they are built of the same material and maintain the same ratio between parts, they are able equally, or rather proportionally, to resist or yield to such external disturbances and blows. For we can demonstrate by geometry that the large machine is not proportionately stronger than the small. Finally, we may say that, for every machine and structure, whether artificial or natural, there is set a necessary limit beyond which neither art nor nature can pass; it is here understood, of course, that the material is the same and the proportion preserved. not be possible to find two single poles made of the same wood which shall be alike in strength and resistance but unlike in size. parallel to the horizon, it may be reduced to such a length that it will just support itself; so that if a hair's breadth be added to its length it will break under its own weight and will be the only rod of the kind in the world. * Thus if, for instance, its length be a hundred times its breadth, you will not be able to find another rod whose length is also a hundred times its breadth and which, like the former, is just able to sustain its own weight and no more: all the larger ones will break while all the shorter ones will be strong enough to support something more than their own weight. 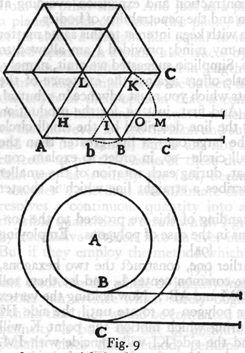 And this which I have said about the ability to support itself must be understood to apply also to other tests; so that if a piece of scantling [corrente] will carry the weight of ten similar to itself, a beam [trave] having the same proportions will not be able to support ten similar beams. (5) large and the very small are equally feasible and lasting is a manifest error. Thus, for example, a small obelisk or column or other solid figure can certainly be laid down or set up without danger of breaking, while the large ones will go to pieces under the slightest provocation, and that purely on account of their own weight. And here I must relate a circumstance which is worthy of your attention as indeed are all events which happen contrary to expectation, especially when a precautionary measure turns out to be a cause of disaster. A large marble column was laid out so that its two ends rested each upon a piece of beam; a little later it occurred to a mechanic that, in order to be doubly sure of its not breaking in the middle by its own weight, it would be wise to lay a third support midway; this seemed to all an excellent idea; but the sequel showed that it was quite the opposite, for not many months passed before the column was found cracked and broken exactly above the new middle support. SIMP. A very remarkable and thoroughly unexpected accident, especially if caused by placing that new support in the middle. SALV. Surely this is the explanation, and the moment the cause is known our surprise vanishes; for when the two pieces of the column were placed on level ground it was observed that one of the end beams had, after a long while, become decayed and sunken, but that the middle one remained hard and strong, thus causing one half of the column to project in the air without any support. Under these circumstances the body therefore behaved differently from what it would have done if suppported only upon the first beams; because no matter how much they might have sunken the column would have gone with them. This is an accident which could not possibly have happened to a small column, even though made of the same stone and having a length corresponding to its thickness, i.e., preserving the ratio between thickness and length found in the large pillar. puzzled because, on the contrary, I have noticed in other cases that the strength and resistance against breaking increase in a larger ratio than the amount of material. Thus, for instance, if two nails be driven into a wall, the one which is twice as big as the other will support not only twice as much weight as the other, but three or four times as much. SALV. Indeed you will not be far wrong if you say eight times as much; nor does this phenomenon contradict the other even though in appearance they seem so different. SAGR. Will you not then, Salviati, remove these difficulties and clear away these obscurities if possible: for I imagine that this problem of resistance opens up a field of beautiful and useful ideas; and if you are pleased to make this the subject of to-day's discourse you will place Simplicio and me under many obligations. SALV. I am at your service if only I can call to mind what I learned from our Academician * who had thought much upon this subject and according to his custom had demonstrated everything by geometrical methods so that one might fairly call this a new science. For, although some of his conclusions had been reached by others, first of all by Aristotle, these are not the most beautiful and, what is more important, they had not been proven in a rigid manner from fundamental principles. Now, since I wish to convince you by demonstrative reasoning rather than to persuade you by mere probabilities, I shall suppose that you are familiar with present-day mechanics so far as it is needed in our discussion. First of all it is necessary to consider what happens when a piece of wood or any other solid which coheres firmly is broken; for this is the fundamental fact, involving the first and simple principle which we must take for granted as well known. coerenza] between the parts of this solid, so long as they are not infinite, can be overcome by the pull of the weight C, a weight which can be increased indefinitely until finally the solid breaks like a rope. And as in the case of the rope whose strength we know to be derived from a multitude of hemp threads which compose it, so in the case of the wood, we observe its fibres and filaments run lengthwise and render it much stronger than a hemp rope of the same thickness. But in the case of a stone or metallic cylinder where the coherence seems to be still greater the cement which holds the parts together must be something other than filaments and fibres; and yet even this can be broken by a strong pull. SIMP. If this matter be as you say I can well understand that the fibres of the wood, being as long as the piece of wood itself, render it strong and resistant against large forces tending to break it. But how can one make a rope one hundred cubits long out of hempen fibres which are not more than two or three cubits long, and still give it so much strength? Besides, I should be glad to hear your opinion as to the manner in which the parts of metal, stone, and other materials not showing a filamentous structure are put together; for, if I mistake not, they exhibit even greater tenacity. SALV. To solve the problems which you raise it will be necessary to make a digression into subjects which have little bearing upon our present purpose. frequently discover something more interesting and beautiful than the solution originally sought? I beg of you, therefore, to grant the request of Simplicio, which is also mine; for I am no less curious and desirous than he to learn what is the binding material which holds together the parts of solids so that they can scarcely be separated. This information is also needed to understand the coherence of the parts of fibres themselves of which some solids are built up. SALV. I am at your service, since you desire it. The first question is, How are fibres, each not more than two or three cubits in length, so tightly bound together in the case of a rope one hundred cubits long that great force [violenza] is required to break it? Now tell me, Simplicio, can you not hold a hempen fibre so tightly between your fingers that I, pulling by the other end, would break it before drawing it away from you? Certainly you can. And now when the fibres of hemp are held not only at the ends, but are grasped by the surrounding medium throughout their entire length is it not manifestly more difficult to tear them loose from what holds them than to break them? But in the case of the rope the very act of twisting causes the threads to bind one another in such a way that when the rope is stretched with a great force the fibres break rather than separate from each other. At the point where a rope parts the fibres are, as everyone knows, very short, nothing like a cubit long, as they would be if the parting of the rope occurred, not by the breaking of the filaments, but by their slipping one over the other. SAGR. In confirmation of this it may be remarked that ropes sometimes break not by a lengthwise pull but by excessive twisting. This, it seems to me, is a conclusive argument because the threads bind one another so tightly that the compressing fibres do not permit those which are compressed to lengthen the spirals even that little bit by which it is necessary for them to lengthen in order to surround the rope which, on twisting, grows shorter and thicker. contact becomes longer and in consequence more resistant; so that the cord slips and yields to the tractive force with increasing difficulty. Is it not clear that this is precisely the kind of resistance which one meets in the case of a thick hemp rope where the fibres form thousands and thousands of similar spirals? And, indeed, the binding effect of these turns is so great that a few short rushes woven together into a few interlacing spirals form one of the strongest of ropes which I believe they call pack rope [susta]. more tightly and hold himself from slipping, or slacken his hold and descend as slowly as he wished. SALV. A truly ingenious device! I feel, however, that for a complete explanation other considerations might well enter; yet I must not now digress upon this particular topic since you are waiting to hear what I think about the breaking strength of other materials which, unlike ropes and most woods, do not show a filamentous structure. The coherence of these bodies is, in my estimation, produced by other causes which may be grouped under two heads. One is that much-talked-of repugnance which nature exhibits towards a vacuum; but this horror of a vacuum not being sufficient, it is necessary to introduce another cause in the form of a gluey or viscous substance which binds firmly together the component parts of the body. First I shall speak of the vacuum, demonstrating by definite experiment the quality and quantity of its force [virtù]. If you take two highly polished and smooth plates of marble, metal, or glass and place them face to face, one will slide over the other with the greatest ease, showing conclusively that there is nothing of a viscous nature between them. But when you attempt to separate them and keep them at a constant distance apart, you find the plates exhibit such a repugnance to separation that the upper one will carry the lower one with it and keep it lifted indefinitely, even when the latter is big and heavy. plates is doubtless likewise present between the parts of a solid, and enters, at least in part, as a concomitant cause of their coherence. SAGR. Allow me to interrupt you for a moment, please; for I want to speak of something which just occurs to me, namely, when I see how the lower plate follows the upper one and how rapidly it is lifted, I feel sure that, contrary to the opinion of many philosophers, including perhaps even Aristotle himself, motion in a vacuum is not instantaneous. If this were so the two plates mentioned above would separate without any resistance whatever, seeing that the same instant of time would suffice for their separation and for the surrounding medium to rush in and fill the vacuum between them. The fact that the lower plate follows the upper one allows us to infer, not only that motion in a vacuum is not instantaneous, but also that, between the two plates, a vacuum really exists, at least for a very short time, sufficient to allow the surrounding medium to rush in and fill the vacuum; for if there were no vacuum there would be no need of any motion in the medium. One must admit then that a vacuum is sometimes produced by violent motion [violenza] or contrary to the laws of nature, (although in my opinion nothing occurs contrary to nature except the impossible, and that never occurs). But here another difficulty arises. While experiment convinces me of the correctness of this conclusion, my mind is not entirely satisfied as to the cause to which this effect is to be attributed. For the separation of the plates precedes the formation of the vacuum which is produced as a consequence of this separation; and since it appears to me that, in the order of nature, the cause must precede the effect, even though it appears to follow in point of time, and since every positive effect must have a positive cause, I do not see how the adhesion of two plates and their resistance to separation -- actual facts -- can be referred to a vacuum as cause when this vacuum is yet to follow. According to the infallible maxim of the Philosopher, the non-existent can produce no effect. SIMP. Seeing that you accept this axiom of Aristotle, I hardly think you will reject another excellent and reliable maxim of his, namely, Nature undertakes only that which happens without resistance; and in this saying, it appears to me, you will find the solution of your difficulty. Since nature abhors a vacuum, she prevents that from which a vacuum would follow as a necessary consequence. Thus it happens that nature prevents the separation of the two plates. SAGR. Now admitting that what Simplicio says is an adequate solution of my difficulty, it seems to me, if I may be allowed to resume my former argument, that this very resistance to a vacuum ought to be sufficient to hold together the parts either of stone or of metal or the parts of any other solid which is knit together more strongly and which is more resistant to separation. If for one effect there be only one cause, or if, more being assigned, they can be reduced to one, then why is not this vacuum which really exists a sufficient cause for all kinds of resistance? SALV. I do not wish just now to enter this discussion as to whether the vacuum alone is sufficient to hold together the separate parts of a solid body; but I assure you that the vacuum which acts as a sufficient cause in the case of the two plates is not alone sufficient to bind together the parts of a solid cylinder of marble or metal which, when pulled violently, separates and divides. And now if I find a method of distinguishing this well known resistance, depending upon the vacuum, from every other kind which might increase the coherence, and if I show you that the aforesaid resistance alone is not nearly sufficient for such an effect, will you not grant that we are bound to introduce another cause? Help him, Simplicio, since he does not know what reply to make. SIMP. Surely, Sagredo's hesitation must be owing to another reason, for there can be no doubt concerning a conclusion which is at once so clear and logical. But go ahead, Salviati; assume that I admit your conclusion and show us your method of separating the action of the vacuum from other causes; and by measuring it show us how it is not sufficient to produce the effect in question. offers a resistance to the separation of its parts this can be attributed to no other cause than the resistance of the vacuum. In order to try such an experiment I have invented a device which I can better explain by means of a sketch than by mere words. Let CABD represent the cross section of a cylinder either of metal or, preferably, of glass, hollow inside and accurately turned. Into this is introduced a perfectly fitting cylinder of wood, represented in cross section by EGHF, and capable of up-and-down motion. Through the middle of this cylinder is bored a hole to receive an iron wire, carrying a hook at the end K, while the upper end of the wire, I, is provided with a conical head. 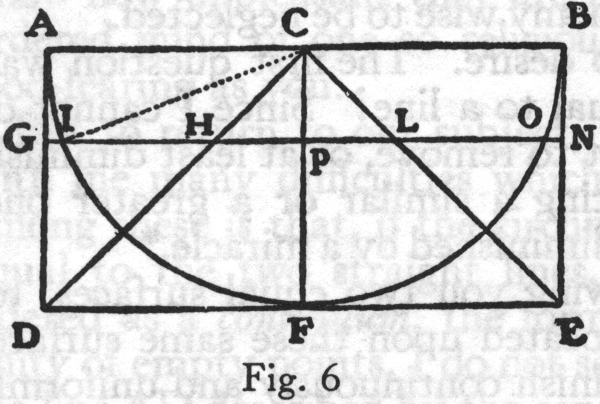 The wooden cylinder is countersunk at the top so as to receive, with a perfect fit, the conical head I of the wire, IK, when pulled down by the end K.
or glass a weight which, together with the weight of the marble or glass itself, is just equal to the sum of the weights before mentioned, and if breaking occurs we shall then be justified in saying that the vacuum alone holds the parts of the marble and glass together; but if this weight does not suffice and if breaking occurs only after adding, say, four times this weight, we shall then be compelled to say that the vacuum furnishes only one fifth of the total resistance [resistenza]. SIMP. No one can doubt the cleverness of the device; yet it presents many difficulties which make me doubt its reliability. For who will assure us that the air does not creep in between the glass and stopper even if it is well packed with tow or other yielding material? I question also whether oiling with wax or turpentine will suffice to make the cone, I, fit snugly on its seat. Besides, may not the parts of the water expand and dilate? Why may not the air or exhalations or some other more subtile substances penetrate the pores of the wood, or even of the glass itself? air from penetrating the wood or passing between the wood and the glass. But now let me point out that, as our experience increases, we shall learn whether or not these alleged difficulties really exist. For if, as is the case with air, water is by nature expansible, although only under severe treatment, we shall see the stopper descend; and if we put a small excavation in the upper part of the glass vessel, such as indicated by V, then the air or any other tenuous and gaseous substance, which might penetrate the pores of glass or wood, would pass through the water and collect in this receptacle V. But if these things do not happen we may rest assured that our experiment has been performed with proper caution; and we shall discover that water does not dilate and that glass does not allow any material, however tenuous, to penetrate it. that the same thing would happen, only much more easily, to a column of water. And really is not that thing which is attracted in the pump a column of water attached at the upper end and stretched more and more until finally a point is reached where it breaks, like a rope, on account of its excessive weight? SALV. That is precisely the way it works; this fixed elevation of eighteen cubits is true for any quantity of water whatever, be the pump large or small or even as fine as a straw. We may therefore say that, on weighing the water contained in a tube eighteen cubits long, no matter what the diameter, we shall obtain the value of the resistance of the vacuum in a cylinder of any solid material having a bore of this same diameter. And having gone so far, let us see how easy it is to find to what length cylinders of metal, stone, wood, glass, etc., of any diameter can be elongated without breaking by their own weight. find the maximum length of wire or rod of any material which will just sustain its own weight, and can at the same time discover the part which the vacuum plays in its breaking strength. SAGR. It still remains for you to tell us upon what depends the resistance to breaking, other than that of the vacuum; what is the gluey or viscous substance which cements together the parts of the solid? For I cannot imagine a glue that will not burn up in a highly heated furnace in two or three months, or certainly within ten or a hundred. For if gold, silver and glass are kept for a long while in the molten state and are removed from the furnace, their parts, on cooling, immediately reunite and bind themselves together as before. Not only so, but whatever difficulty arises with respect to the cementation of the parts of the glass arises also with regard to the parts of the glue; in other words, what is that which holds these parts together so firmly? SALV. A little while ago, I expressed the hope that your good angel might assist you. I now find myself in the same straits. Experiment leaves no doubt that the reason why two plates cannot be separated, except with violent effort, is that they are held together by the resistance of the vacuum; and the same can be said of two large pieces of a marble or bronze column. This being so, I do not see why this same cause may not explain the coherence of smaller parts and indeed of the very smallest particles of these materials. Now, since each effect must have one true and sufficient cause and since I find no other cement, am I not justified in trying to discover whether the vacuum is not a sufficient cause? SIMP. But seeing that you have already proved that the resistance which the large vacuum offers to the separation of two large parts of a solid is really very small in comparison with that cohesive force which binds together the most minute parts, why do you hesitate to regard this latter as something very different from the former? move freely so that the mass [massa] becomes fluid and remains so as long as the particles of fire remain inside; but if they depart and leave the former vacua then the original attraction [attrazzione] returns and the parts are again cemented together. by great cables, is overcome and lifted, when the south wind carries innumerable atoms of water, suspended in thin mist, which moving through the air penetrate between the fibres of the tense ropes in spite of the tremendous force of the hanging weight. When these particles enter the narrow pores they swell the ropes, thereby shorten them, and perforce lift the heavy mass [mole]. SAGR. There can be no doubt that any resistance, so long as it is not infinite, may be overcome by a multitude of minute forces. Thus a vast number of ants might carry ashore a ship laden with grain. And since experience shows us daily that one ant can easily carry one grain, it is clear that the number of grains in the ship is not infinite, but falls below a certain limit. If you take another number four or six times as great, and if you set to work a corresponding number of ants they will carry the grain ashore and the boat also. It is true that this will call for a prodigious number of ants, but in my opinion this is precisely the case with the vacua which bind together the least particles of a metal. SALV. But even if this demanded an infinite number would you still think it impossible? SAGR. Not if the mass [mole] of metal were infinite; otherwise. . . .
O at the same time the side IK assumes the position OP; but in the meantime the center G has traversed a path above GV and does not return to it until it has completed the arc GC. This step having been taken, the larger polygon has been brought to rest with its side BC coinciding with the line BQ while the side IK of the smaller polygon has been made to coincide with the line OP, having passed over the portion IO without touching it; also the center G will have reached the position C after having traversed all its course above the parallel line GV. And finally the entire figure will assume a position similar to the first, so that if we continue the rotation and come to the next step, the side DC of the larger polygon will coincide with the portion QX and the side KL of the smaller polygon, having first skipped the arc PY, will fall on YZ, while the center still keeping above the line GV will return to it at R after having jumped the interval CR. At the end of one complete rotation the larger polygon will have traced upon the line AS, without break, six lines together equal to its perimeter; the lesser polygon will likewise have imprinted six lines equal to its perimeter, but separated by the interposition of five arcs, whose chords represent the parts of HT not touched by the polygon: the center G never reaches the line GV except at six points. From this it is clear that the space traversed by the smaller polygon is almost equal to that traversed by the larger, that is, the line HT approximates the line AS, differing from it only by the length of one chord of one of these arcs, provided we understand the line HT to include the five skipped arcs. similar, concentric, and rigidly connected, so that when the greater one rotates the lesser will also turn however small it may be. You must also understand that the lines described by these two are nearly equal provided we include in the space traversed by the smaller one the intervals which are not touched by any part of the perimeter of this smaller polygon. 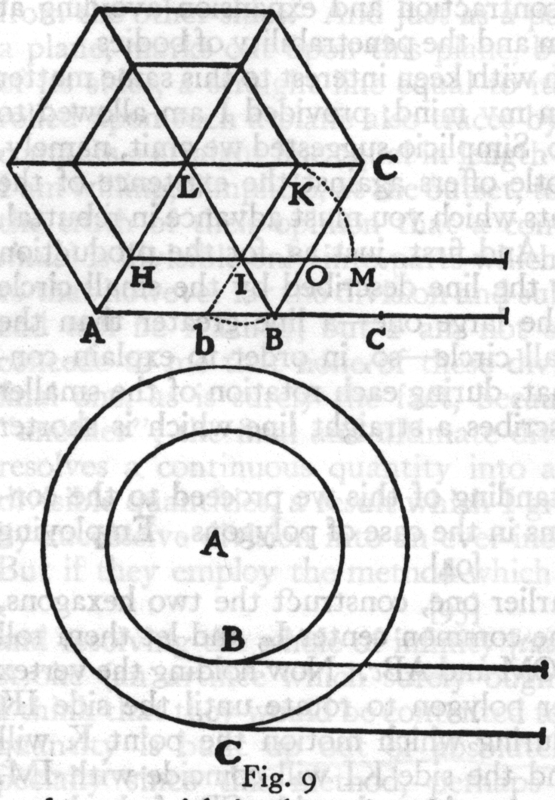 Let a large polygon of, say, one thousand sides make one complete rotation and thus lay off a line equal to its perimeter; at the same time the small one will pass over an approximately equal distance, made up of a thousand small portions, each equal to one of its sides, but interrupted by a thousand spaces which, in contrast with the portions that coincide with the sides of the polygon, we may call empty. So far the matter is free from difficulty or doubt. But now suppose that about any center, say A, we describe two concentric and rigidly connected circles; and suppose that from the points C and B, on their radii, there are drawn the tangents CE and BF and that through the center A the line AD is drawn parallel to them, then if the large circle makes one complete rotation along the line BF, equal not only to its circumference but also to the other two lines CE and AD, tell me what the smaller circle will do and also what the center will do. As to the center it will certainly traverse and touch the entire line AD while the circumference of the smaller circle will have measured off by its points of contact the entire line CE, just as was done by the above mentioned polygons. The only difference is that the line HT was not at every point in contact with the perimeter of the smaller polygon, but there were left untouched as many vacant spaces as there were spaces coinciding with the sides. But here in the case of the circles the circumference of the smaller one never leaves the line CE, so that no part of the latter is left untouched, nor is there ever a time when some point on the circle is not in contact with the straight line. How now can the smaller circle traverse a length greater than its circumference unless it go by jumps? SAGR. It seems to me that one may say that just as the center of the circle, by itself, carried along the line AD is constantly in contact with it, although it is only a single point, so the points on the circumference of the smaller circle, carried along by the motion of the larger circle, would slide over some small parts of the line CE. because there is no ground for thinking that one point of contact, such as that at C, rather than another, should slip over certain portions of the line CE. But if such slidings along CE did occur they would be infinite in number since the points of contact (being mere points) are infinite in number: an infinite number of finite slips will however make an infinitely long line, while as a matter of fact the line CE is finite. The other reason is that as the greater circle, in its rotation, changes its point of contact continuously the lesser circle must do the same because B is the only point from which a straight line can be drawn to A and pass through C. Accordingly the small circle must change its point of contact whenever the large one changes: no point of the small circle touches the straight line CE in more than one point. Not only so, but even in the rotation of the polygons there was no point on the perimeter of the smaller which coincided with more than one point on the line traversed by that perimeter; this is at once clear when you remember that the line IK is parallel to BC and that therefore IK will remain above IP until BC coincides with BQ, and that IK will not lie upon IP except at the very instant when BC occupies the position BQ; at this instant the entire line IK coincides with OP and immediately afterwards rises above it. SAGR. This is a very intricate matter. I see no solution. Pray explain it to us. is not possible to arrange them again into a greater length than that which they occupied when they formed a continuum [continuate] and were connected without the interposition of as many empty spaces. But if we consider the line resolved into an infinite number of infinitely small and indivisible parts, we shall be able to conceive the line extended indefinitely by the interposition, not of a finite, but of an infinite number of infinitely small indivisible empty spaces. Now this which has been said concerning simple lines must be understood to hold also in the case of surfaces and solid bodies, it being assumed that they are made up of an infinite, not a finite, number of atoms. Such a body once divided into a finite number of parts it is impossible to reassemble them so as to occupy more space than before unless we interpose a finite number of empty spaces, that is to say, spaces free from the substance of which the solid is made. But if we imagine the body, by some extreme and final analysis, resolved into its primary elements, infinite in number, then we shall be able to think of them as indefinitely extended in space, not by the interposition of a finite, but of an infinite number of empty spaces. Thus one can easily imagine a small ball of gold expanded into a very large space without the introduction of a finite number of empty spaces, always provided the gold is made up of an infinite number of indivisible parts. SIMP. It seems to me that you are travelling along toward those vacua advocated by a certain ancient philosopher. SALV. But you have failed to add, "who denied Divine Providence," an inapt remark made on a similar occasion by a certain antagonist of our Academician. SIMP. I noticed, and not without indignation, the rancor of this ill-natured opponent; further references to these affairs I omit, not only as a matter of good form, but also because I know how unpleasant they are to the good tempered and well ordered mind of one so religious and pious, so orthodox and God-fearing as you. But to return to our subject, your previous discourse leaves with me many difficulties which I am unable to solve. First among these is that, if the circumferences of the two circles are equal to the two straight lines, CE and BF, the latter considered as a continuum, the former as interrupted with an infinity of empty points, I do not see how it is possible to say that the line AD described by the center, and made up of an infinity of points, is equal to this center which is a single point. Besides, this building up of lines out of points, divisibles out of indivisibles, and finites out of infinites, offers me an obstacle difficult to avoid; and the necessity of introducing a vacuum, so conclusively refuted by Aristotle, presents the same difficulty. SALV. These difficulties are real; and they are not the only ones. But let us remember that we are dealing with infinities and indivisibles, both of which transcend our finite understanding, the former on account of their magnitude, the latter because of their smallness. In spite of this, men cannot refrain from discussing them, even though it must be done in a roundabout way. Therefore I also should like to take the liberty to present some of my ideas which, though not necessarily convincing, would, on account of their novelty, at least, prove somewhat startling. But such a diversion might perhaps carry us too far away from the subject under discussion and might therefore appear to you inopportune and not very pleasing. which our discussion has suggested to you; for since we are free from urgent business there will be abundant time to pursue the topics already mentioned; and in particular the objections raised by Simplicio ought not in any wise to be neglected. And this I shall do by showing you two equal surfaces, together with two equal solids located upon these same surfaces as bases, all four of which diminish continuously and uniformly in such a way that their remainders always preserve equality among themselves, and finally both the surfaces and the solids terminate their previous constant equality by degenerating, the one solid and the one surface into a very long line, the other solid and the other surface into a single point; that is, the latter to one point, the former to an infinite number of points. SAGR. This proposition appears to me wonderful, indeed; but let us hear the explanation and demonstration. form their bases; for these also preserve equality between themselves throughout their diminution and in the end vanish, the one into the circumference of a circle, the other into a single point. Shall we not then call them equal seeing that they are the last traces and remnants of equal magnitudes? 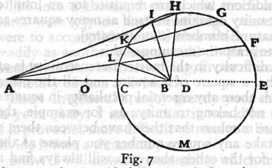 Note also that, even if these vessels were large enough to contain immense celestial hemispheres, both their upper edges and the apexes of the cones therein contained would always remain equal and would vanish, the former into circles having the dimensions of the largest celestial orbits, the latter into single points. Hence in conformity with the preceding we may say that all circumferences of circles, however different, are equal to each other, and are each equal to a single point. pray give us this geometrical proof that there is always equality between these solids and between their bases; for it cannot, I think, fail to be very ingenious, seeing how subtle is the philosophical argument based upon this result. SAGR. The demonstration is ingenious and the inferences drawn from it are remarkable. And now let us hear something concerning the other difficulty raised by Simplicio, if you have anything special to say, which, however, seems to me hardly possible, since the matter has already been so thoroughly discussed. we wish to build up a line out of indivisible points, we must take an infinite number of them, and are, therefore, bound to understand both the infinite and the indivisible at the same time. Many ideas have passed through my mind concerning this subject, some of which, possibly the more important, I may not be able to recall on the spur of the moment; but in the course of our discussion it may happen that I shall awaken in you, and especially in Simplicio, objections and difficulties which in turn will bring to memory that which, without such stimulus, would have lain dormant in my mind. Allow me therefore the customary liberty of introducing some of our human fancies, for indeed we may so call them in comparison with supernatural truth which furnishes the one true and safe recourse for decision in our discussions and which is an infallible guide in the dark and dubious paths of thought. One of the main objections urged against this building up of continuous quantities out of indivisible quantities [continuo d' indivisibili] is that the addition of one indivisible to another cannot produce a divisible, for if this were so it would render the indivisible divisible. Thus if two indivisibles, say two points, can be united to form a quantity, say a divisible line, then an even more divisible line might be formed by the union of three, five, seven, or any other odd number of points. Since however these lines can be cut into two equal parts, it becomes possible to cut the indivisible, which lies exactly in the middle of the line. In answer to this and other objections of the same type we reply that a divisible magnitude cannot be constructed out of two or ten or a hundred or a thousand indivisibles, but requires an infinite number of them. SIMP. Here a difficulty presents itself which appears to me insoluble. Since it is clear that we may have one line greater than another, each containing an infinite number of points, we are forced to admit that, within one and the same class, we may have something greater than infinity, because the infinity of points in the long line is greater than the infinity of points in the short line. This assigning to an infinite quantity a value greater than infinity is quite beyond my comprehension. this I think is wrong, for we cannot speak of infinite quantities as being the one greater or less than or equal to another. To prove this I have in mind an argument which, for the sake of clearness, I shall put in the form of questions to Simplicio who raised this difficulty. SIMP. I am quite aware that a squared number is one which results from the multiplication of another number by itself; thus 4, 9, etc., are squared numbers which come from multiplying 2, 3, etc., by themselves. SALV. Very well; and you also know that just as the products are called squares so the factors are called sides or roots; while on the other hand those numbers which do not consist of two equal factors are not squares. Therefore if I assert that all numbers, including both squares and non-squares, are more than the squares alone, I shall speak the truth, shall I not? SIMP. If I should ask further how many squares there are one might reply truly that there are as many as the corresponding number of roots, since every square has its own root and every root its own square, while no square has more than one root and no root more than one square. part to be squares; and up to a million only 1/1000 part; on the other hand in an infinite number, if one could conceive of such a thing, he would be forced to admit that there are as many squares as there are numbers all taken together. SAGR. What then must one conclude under these circumstances? but only to finite, quantities. When therefore Simplicio introduces several lines of different lengths and asks me how it is possible that the longer ones do not contain more points than the shorter, I answer him that one line does not contain more or less or just as many points as another, but that each line contains an infinite number. Or if I had replied to him that the points in one line were equal in number to the squares; in another, greater than the totality of numbers; and in the little one, as many as the number of cubes, might I not, indeed, have satisfied him by thus placing more points in one line than in another and yet maintaining an infinite number in each? So much for the first difficulty. to avoid the conclusion that these lines are built up of an infinite number of indivisible quantities because a division and a subdivision which can be carried on indefinitely presupposes that the parts are infinite in number, otherwise the subdivision would reach an end; and if the parts are infinite in number, we must conclude that they are not finite in size, because an infinite number of finite quantities would give an infinite magnitude. And thus we have a continuous quantity built up of an infinite number of indivisibles. SIMP. But if we can carry on indefinitely the division into finite parts what necessity is there then for the introduction of non-finite parts? SALV. The very fact that one is able to continue, without end, the division into finite parts [in parti quante] makes it necessary to regard the quantity as composed of an infinite number of immeasurably small elements [di infiniti non quanti]. Now in order to settle this matter I shall ask you to tell me whether, in your opinion, a continuum is made up of a finite or of an infinite number of finite parts [parti quante]. SIMP. My answer is that their number is both infinite and finite; potentially infinite but actually finite [infinite, in potenza; e finite, in atto]; that is to say, potentially infinite before division and actually finite after division; because parts cannot be said to exist in a body which is not yet divided or at least marked out; if this is not done we say that they exist potentially. SALV. So that a line which is, for instance, twenty spans long is not said to contain actually twenty lines each one span in length except after division into twenty equal parts; before division it is said to contain them only potentially. Suppose the facts are as you say; tell me then whether, when the division is once made, the size of the original quantity is thereby increased, diminished, or unaffected. SIMP. It neither increases nor diminishes. finite it cannot contain an infinite number of finite parts either actually or potentially. SAGR. How then is it possible to divide a continuum without limit into parts which are themselves always capable of subdivision? SALV This distinction of yours between actual and potential appears to render easy by one method what would be impossible by another. But I shall endeavor to reconcile these matters in another way; and as to the query whether the finite parts of a limited continuum [continuo terminato] are finite or infinite in number I will, contrary to the opinion of Simplicio, answer that they are neither finite nor infinite. SIMP. This answer would never have occurred to me since I did not think that there existed any intermediate step between the finite and the infinite, so that the classification or distinction which assumes that a thing must be either finite or infinite is faulty and defective. 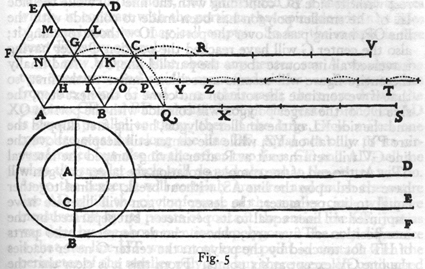 many finite parts as they please and I concede also that it contains them, either actually or potentially, as they may like; but I must add that just as a line ten fathoms [canne] in length contains ten lines each of one fathom and forty lines each of one cubit [braccia] and eighty lines each of half a cubit, etc., so it contains an infinite number of points; call them actual or potential, as you like, for as to this detail, Simplicio, I defer to your opinion and to your judgment. SIMP. I cannot help admiring your discussion; but I fear that this parallelism between the points and the finite parts contained in a line will not prove satisfactory, and that you will not find it so easy to divide a given line into an infinite number of points as the philosophers do to cut it into ten fathoms or forty cubits; not only so, but such a division is quite impossible to realize in practice, so that this will be one of those potentialities which cannot be reduced to actuality. SALV. The fact that something can be done only with effort or diligence or with great expenditure of time does not render it impossible; for I think that you yourself could not easily divide a line into a thousand parts, and much less if the number of parts were 937 or any other large prime number. But if I were to accomplish this division which you deem impossible as readily as another person would divide the line into forty parts would you then be more willing, in our discussion, to concede the possibility of such a division? SIMP. In general I enjoy greatly your method; and replying to your query, I answer that it would be more than sufficient if it prove not more difficult to resolve a line into points than to divide it into a thousand parts. eternity there would still remain finite parts which were undivided. that, since this process carries us farther and farther from the end sought, if on turning back we shall find that any number can be said to be infinite, it must be unity. Here indeed are satisfied all those conditions which are requisite for an infinite number; I mean that unity contains in itself as many squares as there are cubes and natural numbers [tutti i numeri]. SIMP. I do not quite grasp the meaning of this. between 1 and 8 we have 2 and 4 intervening; and between 1 and 27 there lie 3 and 9. Therefore we conclude that unity is the only infinite number. These are some of the marvels which our imagination cannot grasp and which should warn us against the serious error of those who attempt to discuss the infinite by assigning to it the same properties which we employ for the finite, the natures of the two having nothing in common. powder and having resolved it into its infinitely small indivisible atoms why may we not say that this solid has been reduced to a single continuum [un solo continuo] perhaps a fluid like water or mercury or even a liquefied metal? And do we not see stones melt into glass and the glass itself under strong heat become more fluid than water? SAGR. Are we then to believe that substances become fluid in virtue of being resolved into their infinitely small indivisible components? larger and larger particles, of any shape, even if spherical, as is the case with piles of millet, wheat, lead shot, and every other material. But if we attempt to discover such properties in water we do not find them; for when once heaped up it immediately flattens out unless held up by some vessel or other external retaining body; when hollowed out it quickly rushes in to fill the cavity; and when disturbed it fluctuates for a long time and sends out its waves through great distances. transparency of water also favors this view; for the most transparent crystal when broken and ground and reduced to powder loses its transparency; the finer the grinding the greater the loss; but in the case of water where the attrition is of the highest degree we have extreme transparency. Gold and silver when pulverized with acids [acque forti] more finely than is possible with any file still remain powders,* and do not become fluids until the finest particles [gl' indivisibili] of fire or of the rays of the sun dissolve them, as I think, into their ultimate, indivisible, and infinitely small components. SAGR. This phenomenon of light which you mention is one which I have many times remarked with astonishment. I have, for instance, seen lead melted instantly by means of a concave mirror only three hands [palmi] in diameter. Hence I think that if the mirror were very large, well-polished and of a parabolic figure, it would just as readily and quickly melt any other metal, seeing that the small mirror, which was not well polished and had only a spherical shape, was able so energetically to melt lead and burn every combustible substance. Such effects as these render credible to me the marvels accomplished by the mirrors of Archimedes. has recently published on the subject of the burning glass [specchio ustorio] and which I have read with admiration would have removed the last difficulty. pleasure and astonishment; and knowing the author I was confirmed in the opinion which I had already formed of him that he was destined to become one of the leading mathematicians of our age. But now, with regard to the surprising effect of solar rays in melting metals, must we believe that such a furious action is devoid of motion or that it is accompanied by the most rapid of motions? SALV. We observe that other combustions and resolutions are accompanied by motion, and that, the most rapid; note the action of lightning and of powder as used in mines and petards; note also how the charcoal flame, mixed as it is with heavy and impure vapors, increases its power to liquify metals whenever quickened by a pair of bellows. Hence I do not understand how the action of light, although very pure, can be devoid of motion and that of the swiftest type. SAGR. But of what kind and how great must we consider this speed of light to be? Is it instantaneous or momentary or does it like other motions require time? Can we not decide this by experiment? SIMP. Everyday experience shows that the propagation of light is instantaneous; for when we see a piece of artillery fired, at great distance, the flash reaches our eyes without lapse of time; but the sound reaches the ear only after a noticeable interval. SAGR. Well, Simplicio, the only thing I am able to infer from this familiar bit of experience is that sound, in reaching our ear, travels more slowly than light; it does not inform me whether the coming of the light is instantaneous or whether, although extremely rapid, it still occupies time. An observation of this kind tells us nothing more than one in which it is claimed that "As soon as the sun reaches the horizon its light reaches our eyes "; but who will assure me that these rays had not reached this limit earlier than they reached our vision? Let each of two persons take a light contained in a lantern, or other receptacle, such that by the interposition of the hand, the one can shut off or admit the light to the vision of the other. Next let them stand opposite each other at a distance of a few cubits and practice until they acquire such skill in uncovering and occulting their lights that the instant one sees the light of his companion he will uncover his own. After a few trials the response will be so prompt that without sensible error [svario] the uncovering of one light is immediately followed by the uncovering of the other, so that as soon as one exposes his light he will instantly see that of the other. 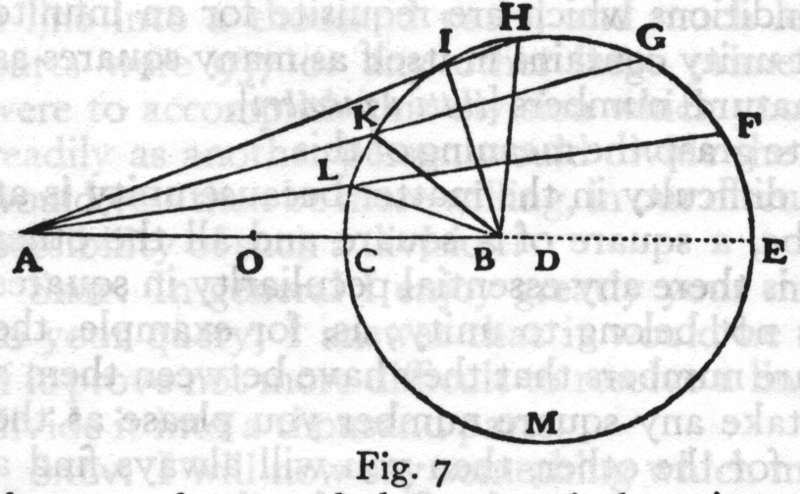 Having acquired skill at this short distance let the two experimenters, equipped as before, take up positions separated by a distance of two or three miles and let them perform the same experiment at night, noting carefully whether the exposures and occultations occur in the same manner as at short distances; if they do, we may safely conclude that the propagation of light is instantaneous; but if time is required at a distance of three miles which, considering the going of one light and the coming of the other, really amounts to six, then the delay ought to be easily observable. 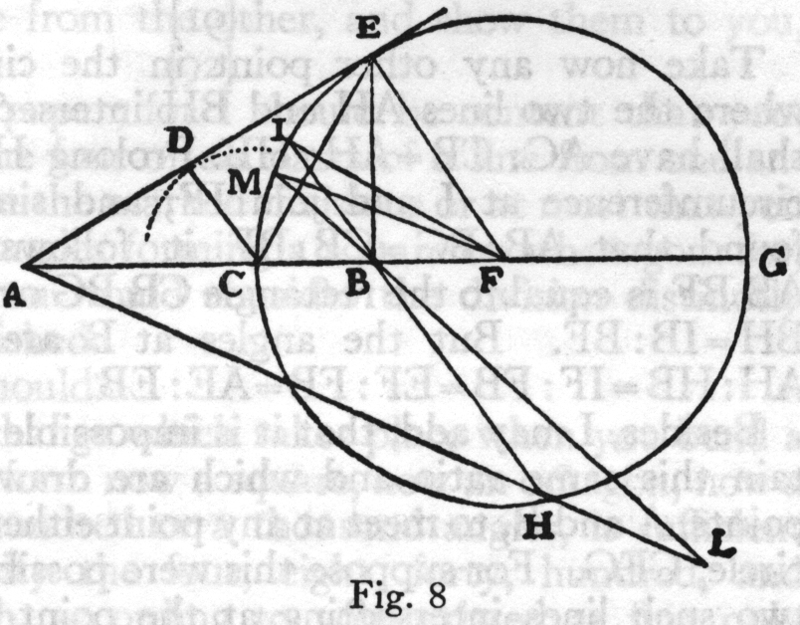 If the experiment is to be made at still greater distances, say eight or ten miles, telescopes may be employed, each observer adjusting one for himself at the place where he is to make the experiment at night; then although the lights are not large and are therefore invisible to the naked eye at so great a distance, they can readily be covered and uncovered since by aid of the telescopes, once adjusted and fixed, they will become easily visible. SAGR. This experiment strikes me as a clever and reliable invention. But tell us what you conclude from the results. source -- located at a particular place among the clouds; but it immediately spreads to the surrounding ones, which seems to be an argument that at least some time is required for propagation; for if the illumination were instantaneous and not gradual, we should not be able to distinguish its origin -- its center, so to speak -- from its outlying portions. What a sea we are gradually slipping into without knowing it! With vacua and infinities and indivisibles and instantaneous motions, shall we ever be able, even by means of a thousand discussions, to reach dry land? SAGR. Really these matters lie far beyond our grasp. Just think; when we seek the infinite among numbers we find it in unity; that which is ever divisible is derived from indivisibles; the vacuum is found inseparably connected with the plenum; indeed the views commonly held concerning the nature of these matters are so reversed that even the circumference of a circle turns out to be an infinite straight line, a fact which, if my memory serves me correctly, you, Salviati, were intending to demonstrate geometrically. Please therefore proceed without further digression. the same ratio as the two portions AC and BC which meet at the point C. This is manifest in the case of the two lines AE and BE, meeting at the point E, because the angle E of the triangle AEB is bisected by the line CE, and therefore AC:CB = AE:BE. The same may be proved of the two lines AG and BG terminating in the point G. For since the triangles AFE and EFB are similar, we have AF:FE = EF:FB, or AF:FC = CF:FB, and dividendo AC:CF = CB:BF, or AC:FG = CB:BF; also componendo we have both AB:BG = CB:BF and AG:GB = CF:FB = AE:EB = AC:BC. Q.E.D. Take now any other point in the circumference, say H, where the two lines AH and BH intersect; in like manner we shall have AC:CB = AH:HB. Prolong HB until it meets the circumference at I and join IF; and since we have already found that AB:BG = CB:BF it follows that the rectangle AB.BF is equal to the rectangle CB.BG or IB.BH. Hence AB:BH = IB:BF. But the angles at B are equal and therefore AH:HB = IF:FB = EF:FB = AE:EB. rectangle CB.BG which is impossible; therefore the intersection cannot fall outside the circle. And in like manner we can show that it cannot fall inside; hence all these intersections fall on the circumference. 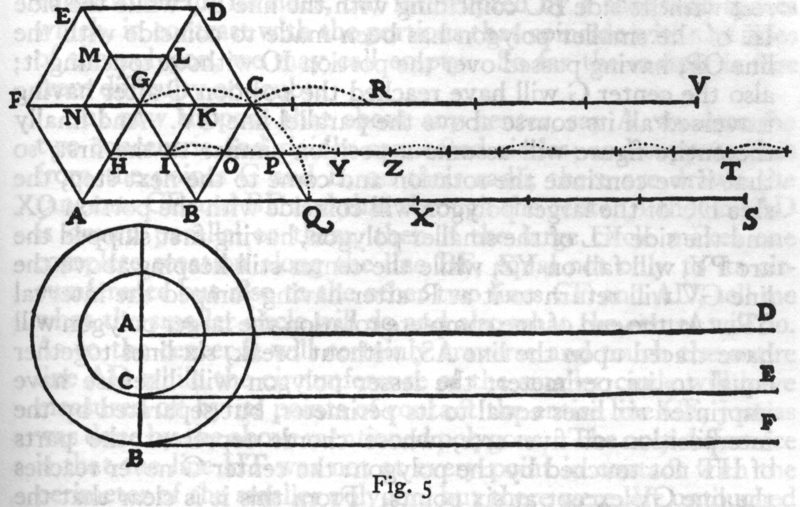 one by one, on this paper; for I should be content that you, without separating the four or six parts of a line from one another, should show me the marked divisions or at most that you should fold them at angles forming a square or a hexagon: for, then, I am certain you would consider the division distinctly and actually accomplished. and resolving the whole of infinity [tutta la infinità], at a single stroke (an artifice which surely ought not to be denied me), I think that they would be contented to admit that a continuous quantity is built up out of absolutely indivisible atoms, especially since this method, perhaps better than any other, enables us to avoid many intricate labyrinths, such as cohesion in solids, already mentioned, and the question of expansion and contraction, without forcing upon us the objectionable admission of empty spaces [in solids] which carries with it the penetrability of bodies. Both of these objections, it appears to me, are avoided if we accept the above-mentioned view of indivisible constituents. I, for want of time and critical ability, am at present unable to solve. Leaving this to one side for the moment, I should like to hear how the introduction of these indivisible quantities helps us to understand contraction and expansion avoiding at the same time the vacuum and the penetrability of bodies. SAGR. I also shall listen with keen interest to this same matter which is far from clear in my mind; provided I am allowed to hear what, a moment ago, Simplicio suggested we omit, namely, the reasons which Aristotle offers against the existence of the vacuum and the arguments which you must advance in rebuttal. SALV. I will do both. And first, just as, for the production of expansion, we employ the line described by the small circle during one rotation of the large one -- a line greater than the circumference of the small circle -- so, in order to explain contraction, we point out that, during each rotation of the smaller circle, the larger one describes a straight line which is shorter than its circumference. are sides less one; this line is approximately equal to that described by the smaller polygon exceeding it only by the distance bB. Here now we see, without any difficulty, why the larger polygon, when carried by the smaller, does not measure off with its sides a line longer than that traversed by the smaller one; this is because a portion of each side is superposed upon its immediately preceding neighbor. does not remain at rest for a while so as to allow BC to move backward and carry with it the point C, as happened in the case of the polygons, where the point I remained fixed until the side KI coincided with MI and the line IB carried the terminal point B backward as far as b, so that the side BC fell upon bc, thus superposing upon the line BA, the portion Bb, and advancing by an amount Bc, equal to MI, that is, to one side of the smaller polygon. On account of these superpositions, which are the excesses of the sides of the larger over the smaller polygon, each net advance is equal to one side of the smaller polygon and, during one complete rotation, these amount to a straight line equal in length to the perimeter of the smaller polygon. and rarefaction of bodies, unless we give up the impenetrability of matter and introduce empty spaces of finite size. If you find anything here that you consider worth while, pray use it; if not regard it, together with my remarks, as idle talk; but this remember, we are dealing with the infinite and the indivisible. SAGR. I frankly confess that your idea is subtle and that it impresses me as new and strange; but whether, as a matter of fact, nature actually behaves according to such a law I am unable to determine; however, until I find a more satisfactory explanation I shall hold fast to this one. Perhaps Simplicio can tell us something which I have not yet heard, namely, how to explain the explanation which the philosophers have given of this abstruse matter; for, indeed, all that I have hitherto read concerning contradiction is so dense and that concerning expansion so thin that my poor brain can neither penetrate the former nor grasp the latter. SIMP. I am all at sea and find difficulties in following either path, especially this new one; because according to this theory an ounce of gold might be rarefied and expanded until its size would exceed that of the earth, while the earth, in turn, might be condensed and reduced until it would become smaller than a walnut, something which I do not believe; nor do I believe that you believe it. The arguments and demonstrations which you have advanced are mathematical, abstract, and far removed from concrete matter; and I do not believe that when applied to the physical and natural world these laws will hold. not more than eight or ten thicknesses. Once gilded they begin to pull it, with great force, through the holes of a draw-plate; again and again it is made to pass through smaller and smaller holes, until, after very many passages, it is reduced to the fineness of a lady's hair, or perhaps even finer; yet the surface remains gilded. Imagine now how the substance of this gold has been expanded and to what fineness it has been reduced. SIMP. I do not see that this process would produce, as a consequence, that marvelous thinning of the substance of the gold which you suggest: first, because the original gilding consisting of ten layers of gold-leaf has a sensible thickness; secondly, because in drawing out the silver it grows in length but at the same time diminishes proportionally in thickness; and, since one dimension thus compensates the other, the area will not be so increased as to make it necessary during the process of gilding to reduce the thinness of the gold beyond that of the original leaves. SALV. You are greatly mistaken, Simplicio, because the surface increases directly as the square root of the length, a fact which I can demonstrate geometrically. SAGR. Please give us the demonstration not only for my own sake but also for Simplicio provided you think we can understand it. The areas of cylinders of equal volumes, neglecting the bases, bear to each other a ratio which is the square root of the ratio of their lengths. is to the line E, that is, as the square root of AB is to the square root of CD. Now cut off the cylinder AB at F so that the altitude AF is equal to CD. Then since the bases of cylinders of equal volume bear to one another the inverse ratio of their heights, it follows that the area of the circular base of the cylinder CD will be to the area of the circular base of AB as the altitude BA is to DC: moreover, since circles are to one another as the squares of their diameters, the said squares will be to each other as BA is to CD. But BA is to CD as the square of BA is to the square of E: and, therefore, these four squares will form a proportion; and likewise their sides; so the line AB is to E as the diameter of circle C is to the diameter of the circle A. But the diameters are proportional to the circumferences and the circumferences are proportional to the areas of cylinders of equal height; hence the line AB is to E as the surface of the cylinder CD is to the surface of the cylinder AF. Now since the height AF is to AB as the surface of AF is to the surface of AB; and since the height AB is to the line E as the surface CD is to AF, it follows, ex oequali in proportione perturbata,* that the height AF is to E as the surface CD is to the surface AB, and convertendo, the surface of the cylinder AB is to the surface of the cylinder CD as the line E is to AF, i. e., to CD, or as AB is to E which is the square root of the ratio of AB to CD. Q.E.D. have been extended over a surface two hundred times greater, assuring us that the thickness of the gold which now covers the surface of so many cubits of wire cannot be greater than one twentieth that of an ordinary leaf of beaten gold. Consider now what degree of fineness it must have and whether one could conceive it to happen in any other way than by enormous expansion of parts; consider also whether this experiment does not suggest that physical bodies [materie fisiche] are composed of infinitely small indivisible particles, a view which is supported by other more striking and conclusive examples. SAGR. This demonstration is so beautiful that, even if it does not have the cogency originally intended, -- although to my mind, it is very forceful -- the short time devoted to it has nevertheless been most happily spent. The volumes of right cylinders having equal curved surfaces are inversely proportional to their altitudes. IF is to the mean proportional between IF and AB. But since one datum of the problem is that the surface of AE is equal to that of CF, and since the surface ID is to the surface CF as the altitude IF is to the altitude CD, it follows that CD is a mean proportional between IF and AB. Not only so, but since the volume of the cylinder ID is equal to that of AE, each will bear the same ratio to the volume of the cylinder CF; but the volume ID is to the volume CF as the altitude IF is to the altitude CD; hence the volume of AE is to the volume of CF as the length IF is to the length CD, that is, as the length CD is to the length AB. Q.E.D. if we have a piece of matting which measures 7 x 25 cubits and make from it a basket, the contents of the basket will, when the seam is lengthwise, be seven as compared with twenty-five when the seam runs endwise. SAGR. It is with great pleasure that we continue thus to acquire new and useful information. 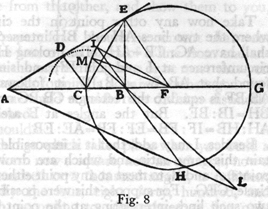 But as regards the subject just discussed, I really believe that, among those who are not already familiar with geometry, you would scarcely find four persons in a hundred who would not, at first sight, make the mistake of believing that bodies having equal surfaces would be equal in other respects. Speaking of areas, the same error is made when one attempts, as often happens, to determine the sizes of various cities by measuring their boundary lines, forgetting that the circuit of one may be equal to the circuit of another while the area of the one is much greater than that of the other. And this is true not only in the case of irregular, but also of regular surfaces, where the polygon having the greater number of sides always contains a larger area than the one with the less number of sides, so that finally the circle which is a polygon of an infinite number of sides contains the largest area of all polygons of equal perimeter. I remember with particular pleasure having seen this demonstration when I was studying the sphere of Sacrobosco* with the aid of a learned commentary. figures, the one which has the larger number of sides contains a greater area than that which has the smaller number. SAGR. Being exceedingly fond of choice and uncommon propositions, I beseech you to let us have your demonstration. two regular and similar polygons of which one circumscribes it and the other is isoperimetric with it. In addition, the area of the circle is less than that of any circumscribed polygon and greater than that of any isoperimetric polygon. And further, of these circumscribed polygons, the one which has the greater number of sides is smaller than the one which has a less number; but, on the other hand, that isoperimetric polygon which has the greater number of sides is the larger. mean proportional between the areas of the two polygons A and B. And since the area of the polygon A is greater than that of the circle A, it is clear that the area of the circle A is greater than that of the isoperimetric polygon B, and is therefore the greatest of all regular polygons having the same perimeter as the circle. We now demonstrate the remaining portion of the theorem, which is to prove that, in the case of polygons circumscribing a given circle, the one having the smaller number of sides has a larger area than one having a greater number of sides; but that on the other hand, in the case of isoperimetric polygons, the one having the more sides has a larger area than the one with less sides. To the circle which has O for center and OA for radius draw the tangent AD; and on this tangent lay off, say, AD which shall represent one-half of the side of a circumscribed pentagon and AC which shall represent one-half of the side of a heptagon; draw the straight lines OGC and OFD; then with O as a center and OC as radius draw the arc ECI. Now since the triangle DOC is greater than the sector EOC and since the sector COI is greater than the triangle COA, it follows that the triangle DOC bears to the triangle COA a greater ratio than the sector EOC bears to the sector COI, that is, than the sector FOG bears to the sector GOA. Hence, componendo et permutando, the triangle DOA bears to the sector FOA a greater ratio than that which the triangle COA to the sector GOA, and also 10 such triangles DOA bear to 10 such sectors FOA a greater ratio than 14 such triangles COA bear to 14 such sectors GOA, that is to say, the circumscribed pentagon bears to the circle a greater ratio than does the heptagon. Hence the pentagon exceeds the heptagon in area. and isoperimetric heptagons, and since also we have proved that the circumscribed pentagon is larger than the circumscribed heptagon, it follows that this circumscribed pentagon bears to the circle a larger ratio than does the heptagon, that is, the circle will bear to its isoperimetric pentagon a greater ratio than to its isoperimetric heptagon. Hence the pentagon is smaller than its isoperimetric heptagon. Q.E.D. SAGR. A very clever and elegant demonstration! But how did we come to plunge into geometry while discussing the objections urged by Simplicio, objections of great moment, especially that one referring to density which strikes me as particularly difficult? up the impenetrability of matter; but this does not exclude the possibility of there being materials which possess no such properties and do not, therefore, carry with them consequences which you call inconvenient and impossible. And finally, Simplicio, I have, for the sake of you philosophers, taken pains to find an explanation of how expansion and contraction can take place without our admitting the penetrability of matter and introducing vacua, properties which you deny and dislike; if you were to admit them, I should not oppose you so vigorously. Now either admit these difficulties or accept my views or suggest something better. SAGR. I quite agree with the peripatetic philosophers in denying the penetrability of matter. As to the vacua I should like to hear a thorough discussion of Aristotle's demonstration in which he opposes them, and what you, Salviati, have to say in reply. I beg of you, Simplicio, that you give us the precise proof of the Philosopher and that you, Salviati, give us the reply.